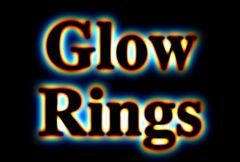 Generates glows of colored rings around the areas of the source clip that are brighter than the given threshold. Raise the threshold parameter to produce glows in fewer areas. Adjust the Width and Thickness RGB parameters to make glows with different color patterns, and adjust the Width XY parameters to make horizontal or vertical glows. Source: The current layer. The input clip that determines the glow locations and colors. Width Red: Default: 0.5, Range: 0 or greater. Width Green: Default: 0.75, Range: 0 or greater. Width Blue: Default: 1, Range: 0 or greater. Thickness Red: Default: 0.5, Range: 0 to 1. Scales the thickness of the red region. Thickness Green: Default: 0.5, Range: 0 to 1. Scales the thickness of the green region. Thickness Blue: Default: 0.5, Range: 0 to 1. Scales the thickness of the blue region. If this value is positive the output Alpha channel will include some opacity from the glows. The maximum of the red, green, and blue glow brightness is scaled by this value and combined with the background Alpha at each pixel. Light Background: Default: 0, Range: 0 to 1. Increase this to give a look of the glow casting light onto the background image. To see this more clearly you can also lower the Background Scale parameter or raise the Brightness parameter. Turns on or off the screen user interface for adjusting the Glow Width parameter.This parameter only appears on AE and Premiere, where on-screen widgets are supported.